This is part 3 of a 10-part series. Now that I’ve described the plot of my stack, I’ll start explaining the details of the physical components that the people on the stack experienced on the day of. The first component I’ll describe is the Android application that the stackees used to receive clues and information during the day. The best part about the tablet computer we used? It cost $55. It’s certainly no impressive piece of hardware, but I love that we live in a world where I can buy a portable computing device that I can program for so cheap. Furthermore, as prices drop, I expect to see more of these on stacks, which can open the way to some pretty exciting demonstrations. 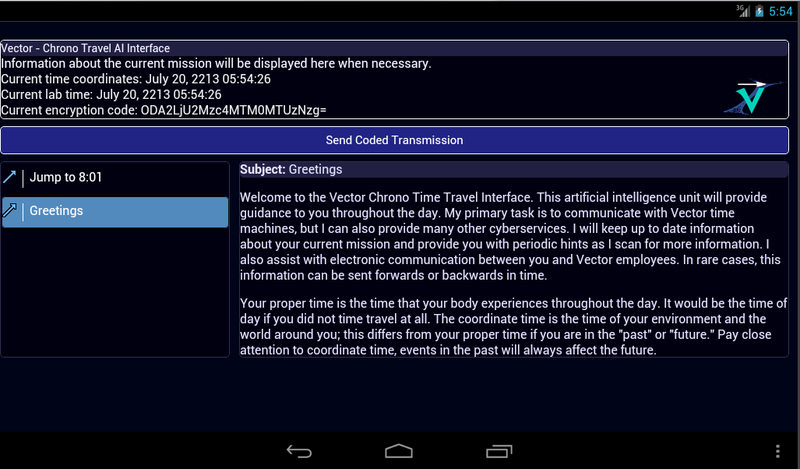 On the screen, the frosh could see a list of messages (which there was only one of at first) from the Vector Corporation and the AI itself, their current space-time coordinate, the current lab time (which was the same as their space-time coordinate at that time, since they hadn’t time traveled yet), the current “encryption key”, and a button that allowed them to send a “coded transmission” to Vector Corporation. The messages served as clues and hints, telling the frosh where to go during the day. The clocks told them both the current time and what times they had jumped to. The coded transmissions were where the frosh put in passwords and other such things that they got from their puzzles so that they could receive the next clue and move on. Finally, the encryption key was mostly flavor text, although I did set up the app to send them a message mocking them should they try to send it as a coded transmission. I wasn’t sure they would try it, but it was actually one of the first things they did. I was so pleased when I saw that they had done that. What the frosh couldn’t see is that the app was also keeping track of all of the passwords they entered and all of the messages they had ‘unlocked’ and storing it in a text file that I could check on the Caltech undergraduate-run computer cluster (the UGCS servers, for those of you who know what that is). Furthermore, the line in the screenshot above that reads “Information about the current mission will be displayed here when necessary” was a line that I could arbitrarily change remotely. It was very useful to have these features so that we could know how far our stackees had gotten on the day of. It also proved useful early on, when they entered the very first password incorrectly (having used the wrong case for the letters). On the other hand, it became all too tempting to helicopter stacker the frosh. While it was fine (in my opinion) to watch their progress, we had to restrain ourselves from sending too many impromptu messages through the app (except the snarky ones that made fun of them — those were fine), lest we ruin the puzzles or the immersion. Thus, our app was built on top of his source code, which was reportedly written in a day before his stack ran (quite impressive). His application was built for a phone and displayed achievements, but not the actual clues for the day. Thus, my contribution was restyling it so that it looked more like a tablet application, updating the code so that it would work on the two year newer Android OS, removing some features we couldn’t use because of our hardware (his application used the phone to GPS track our group, as well as the microphone to listen in on our group — it was quite devious but hilarious when we found out), making the aesthetics and flavor text fit into our theme, and inserting all of our clues and hints. Since the tablet was such an integral component of our stack, it really, really could not fail (we had a backup plan but it wasn’t nearly as good). I basically didn’t touch the server side code at all, since I didn’t need to. This was fortunate, since I’m not familiar with Perl at all. Second, the one advantage we foresaw with having the app was that we didn’t have to spend the entire night before laying out our paper clues, since we didn’t really have paper clues. This was incredibly nice, since we could get our clues done much sooner. However, all of those hopes of saving night-before stress were fruitless, despite having started our stack quite early. It’s always that last 10% that gives you trouble, as anyone who has built a large scale project knows. In the next post, I will describe my favorite physical puzzle on our stack, and one of our two centerpieces: the mirror maze. Unfortunately, the stackees didn’t really capture any video of themselves doing the puzzle, but the puzzle was so good that we ran it with five or six more groups over the next two or three days, so I have a video of one of those runs to show you. Until next time! This is part 1 of a 10-part series. Whew! I write to you on the other side of 38 quite hectic days. Since my first post, I had a great four-day vacation to Las Vegas, packed up literally everything I owned, graduated from Caltech, became a California resident, drove up to the Bay Area, moved into my beautiful (albeit overpriced) San Francisco apartment (edit: I don’t live there anymore as of October 2013 — my new place is much nicer and much more overpriced), bought a bunch of furniture, and started my internship at Sift Science. Now that I have some time to write again, I can finally start off my 10-part Ditch Day series by explaining to you what Ditch Day actually is. As I said in the intro post, Ditch Day is not what you might think given the name. The seniors don’t really ditch in the sense of going to the beach and just relaxing all day (even though I’m pretty sure we’d all have liked to). They do have to leave campus, because any senior spotted on-campus will be duct taped to a tree, and classes are officially cancelled for everyone. The latter is because each group of seniors has built an entire day of entertainment, activities, and puzzles (overall referred to as stacks) for the underclassmen to enjoy all day. On my very first Ditch Day, I worked for an Aperture Science-esque company, where I participated in experiments testing senses and “super-senses”, including taste (having to solve a puzzle with custom-made “tasting gels”), hearing (having to shut off speakers playing the Ride of the Valkyries in a loud and dark room by pushing buttons next to them), pain (having to lick nails connected to a 9V battery to see which were live), balance (having to balance a gigantic suspended metal mobile with our whole bodies), and super-tasting (eating sour food under the influence of Miraculin). More details about that stack are in a blog post written by one of the creators of that stack. 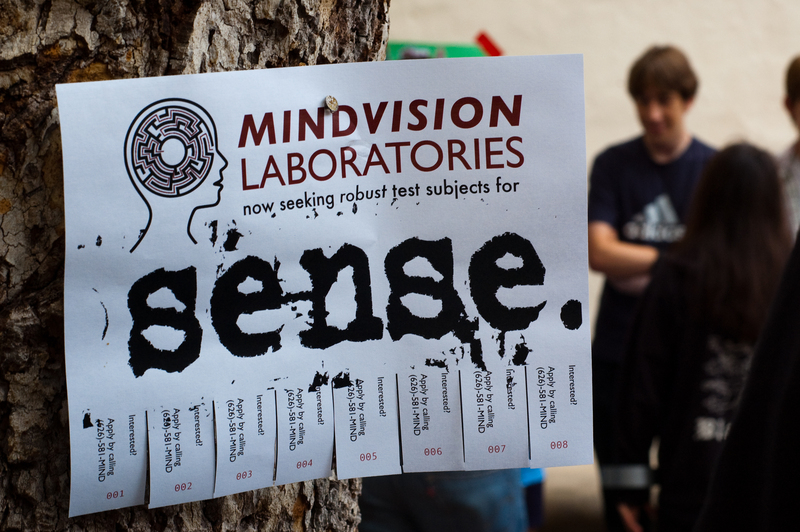 The sign-up poster for “Sense”, the stack I went on my frosh year. The next year, I was part of a real life version of Achievement Unlocked. We were given an Android phone with an application at the beginning of the day that gave us updates on the achievements we had earned as we solved puzzles such as a 3D minesweeper puzzle (which involved lots of boxes in a room), lifted boxes with QR codes on them with one of the official Caltech construction cranes, and played with a mural in our house that used hidden capacitive plates to respond to touch with sound. Little did we know the Android application (and by extension, the seniors who were stuck off-campus) was listening in on our conversations with the phone’s microphone. 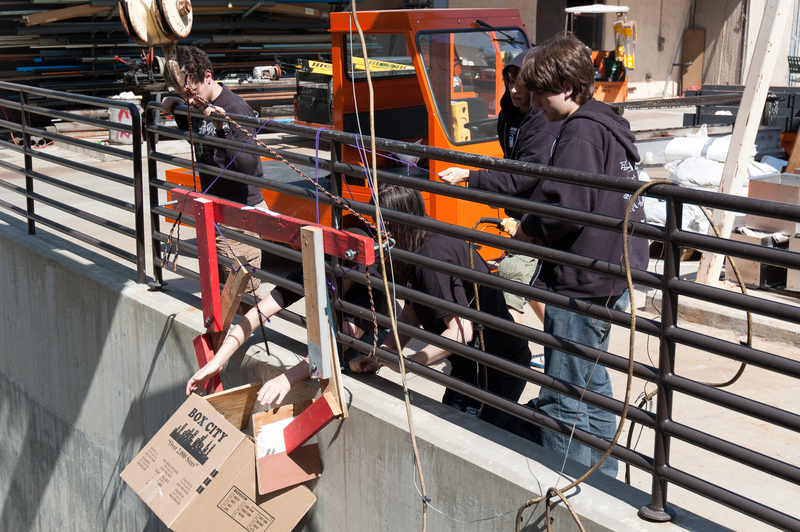 Operating the crane (with wooden claw attached) that we were allowed to use as part of “Achievement Unlocked”. For my last Ditch Day (on the going on stacks side of things), I went on a Calvin & Hobbes stack, where we hung out in a tree house (no girls allowed! ), traveled through time while solving a puzzle that required the use of our safety goggles (3D glasses), and solved a Slitherlink puzzle that had been created in the real world rather than on paper. We also “caught” these amazing Hobbes backpacks. Other awesome stack elements that come to mind are a giant ice wall that people could climb on and a laser maze in the tunnels, and this is all just things that happened while I was there! Ditch Day wasn’t always this way. A long time ago, Caltech seniors did just ditch classes and go to the beach. 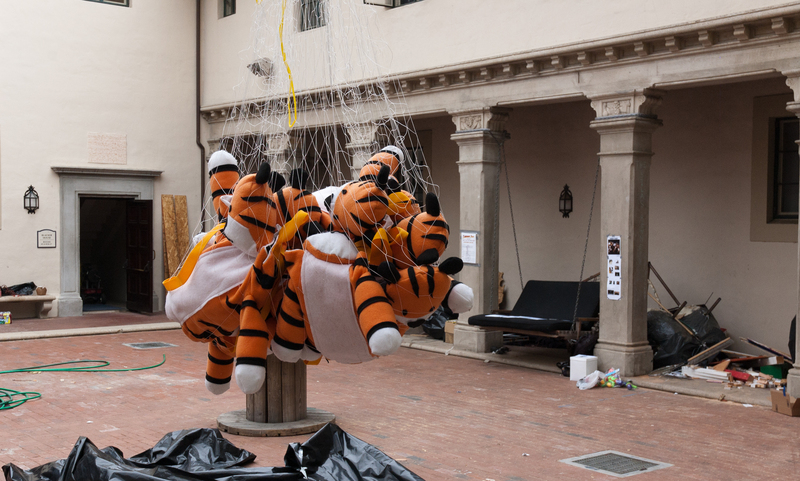 The underclassmen thought this was rather unfair, so in true Caltech style, they began pranking the seniors’ rooms. Soon enough, the seniors began to develop counter-measures for pranking while they ditched. These ranged from placing giant concrete barricades and steel plates on their doors and windows to offering the underclassmen bribes (in the form of some cool or expensive things). I’m sure the bribes eventually became things like paying for cool adventures for the underclassmen. Eventually, things escalated to the point where seniors would build these massive elaborate stacks. As an underclassman, Ditch Day is pretty much the best day of the year. When I was a frosh, I was told that it’s “better than Christmas!” The seniors pretty much spend all of their time from about April (and sometimes much, much earlier) until Ditch Day (toward the end of May) working on their stacks, and it’s always great to see what that much effort out of some of the smartest people in the country can produce. The fact that classes are officially cancelled so that we can do this is especially awesome. However, as an underclassman, we never know when Ditch Day will be! The date is a heavily guarded secret. If you ask any senior, they’ll tell you that “Ditch Day is Tomorrow!” at any point in time, even the newly-minted seniors immediately after the end of the previous Ditch Day — at 5pm, when the cannon fires, the juniors become seniors and the seniors become “ghosts”. To make things even more complicated, the seniors often hold fake Ditch Days — they’ll make a set of announcements at dinner and even put out stack sign-up sheets the next morning. However, these stacks give you around an hour of content until they tell you “go to bed frosh, Ditch Day is Tomorrow!” By the time announcements are over, and definitely by the time you see the sign-up sheets, it’s generally clear that this is a fake Ditch Day (unless it’s the day before the real Ditch Day and the seniors are trying really hard to fool the underclassmen). However, even the fakes are valuable because they give everyone much-needed logistics practice (when to start waking people up, how to sign up for a stack, what the rules are about signing up, what kind of clues to expect on a stack, etc.) and they are pretty good fun to boot. When the class one year above mine became seniors, I went on a Lonely Island themed stack for their first fake, which involved blasting Lonely Island music around campus at 8 in the morning among other things. For a fake Ditch Day from another year, I got to play a mini laser harp. As a senior, you also realize how supportive some departments are of Ditch Day and of students doing cool things in general. In our case, the physics department let us use and have after-hours access to a pretty big space in their large warehouse/lab that contained a lot of expensive equipment for construction and housing of a puzzle. I say some, because some blatantly aren’t. I’m looking at you, Geology and Biology. Both of them wouldn’t let us have the use of classrooms on a day when classes are officially cancelled. Either way, it’s nice to have some evidence that some people are still for keeping the spirit of Caltech alive rather than just paying lip service to the concept. Overall, if you take away one thing from this post, it’s that Ditch Day at Caltech is a big deal and it’s where a lot of very talented scientists and engineers get to do amazing things. In the next post, I’ll introduce the stack that I spent several months building and one of its most integral components: the plot. Ours was unique of all the stacks that I had seen in that the plot was so important to one’s enjoyment of the whole experience, but I’ll explain that next time.